Similar to Whole Foods, Starbucks has a reputation for being an expensive coffee option. While this can be true, there are a number of ways that patrons can keep coffee purchases within reason. There are a number of approaches that you can use to save money on your next Starbucks purchase. It’s so easy and you’ll never again be frustrated with the cost of your next latte. Don’t add on to your drink. The next time you hear the following order “I would like a double tall, extra hot, vanilla, soy, no foam latte.” Be aware that there are 3 up sales in that order. A double refers to two espresso shots-each shot averages around 75 cents. The vanilla in the order refers to vanilla flavoring. Flavorings tend to cost around .35 and soymilk is around .50 cents to add to a drink. Purchase your drinks during “happy hour.” Similar to a bar’s happy hour, drinks are offered at a discount. Talk to your barista to see if they know when the next happy hour will happen. Use your Starbucks Rewards card strategically. Make sure to load your Starbucks card and use it to make purchases. You will usually earn discounts, or a free drink after purchasing a certain number of drinks. You can also access your Starbucks card via the Starbucks app. Don’t buy food at Starbucks. Bistro boxes, pastries, and snack bars are next to the checkout. These are upsell opportunities for Starbucks to increase the average customer purchase. Decrease your weekly visits. This one is hard if you have a daily coffee habit. Alternate your Starbuck visits and go either Tuesday/Thursday or Monday/Wednesday/Friday. Over time this strategy will save a substantial amount of money for consumers. You now have seven savings opportunities that you can use that will enable you to continue enjoying your coffee habit without the guilt. 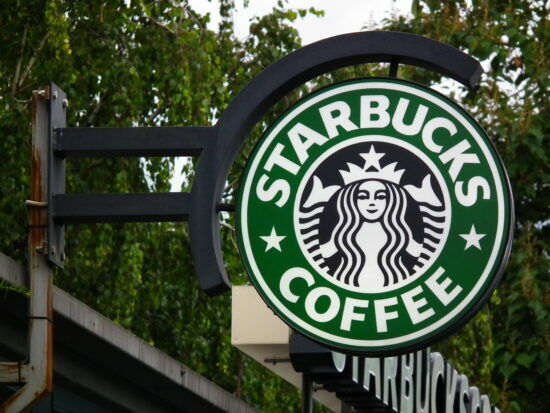 Before your next Starbucks visit, remember to do the following: order smaller, don’t add extras, eating at Starbucks can be expensive, use your rewards card, cut down the number of weekly visits, use the savings opportunities presented to you by Starbucks and finally, enjoy your next drink. It might come as a surprise to many people that McDonalds menus are actually a bit different all over the world. For those of you who have traveled extensively and eaten McDonalds in a country that’s new to you, you’ve already tread in the murky waters of navigating McDonalds menus that are just a little bit different from what you were initially expecting. On a trip to Italy I had the best salad of my trip at a local McDonalds. It was an insalata mixta con calamari or mixed salad greens with calamari and a vinaigrette dressing. 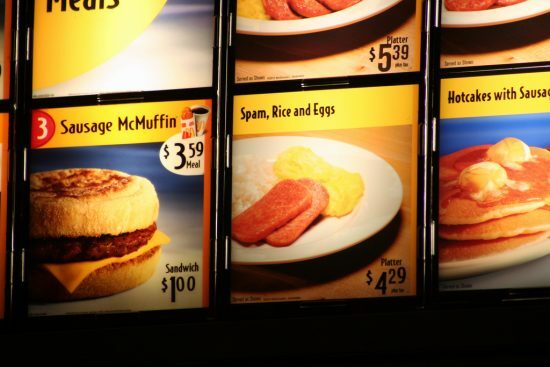 This menu variance also is true for the McDonalds located north of the U.S. border in Canada. Many Americans are probably wondering how different could a Canadian McDonalds be compared to their U.S. counterparts? Aren’t we pretty similar? Well on the surface it seems that way, but there are some differences that start before the food even arrives at a local Canadian McDonalds. Every country has different food regulations. Canada is no different. There are certain additives that are not found in Canadian beef that could potentially be found in American McDonalds burgers. Free McDonald’s Sandwich Just for Downloading Free App! McDonald’s loves giving away prizes. For instance, last month’s McDonald’s Minion Mania resulted in people winning hundreds of thousands of prizes. Monopoly at McDonald’s is always a McDonald’s favorite. However, this app is better in a lot of ways. Downloading this app offers prizes and exclusive offers year-’round. You’re reading this post because you want free food. Fair enough. After downloading the app, you’ll see your free sandwich offerings. You can choose from breakfast sandwiches or burgers – even a McDouble! When you get to McDonald’s, pull up the sandwich options again. Click ‘redeem’. Get your phone scanned at the register. It’s easy. The app is available for download from the Apple App Store or Google Play. The free sandwich offers are limited to 8,000,000 downloads and you must be 13 years of age to accept the free food. If you’re over 13 but under 18, you are still supposed to have a guardian read over the terms of service agreement before installing the app. You can also visit the McDonald’s Mobile App page to signup or read the complete Terms of Service. Not everyone has a smartphone for various reasons. If you don’t have one, you can still get in the loop. You can still get free notifications for freebies. Simply go to the McDonald’s app page and click ‘Join our email list’ in the upper right hand corner. You’ll get connected via email. 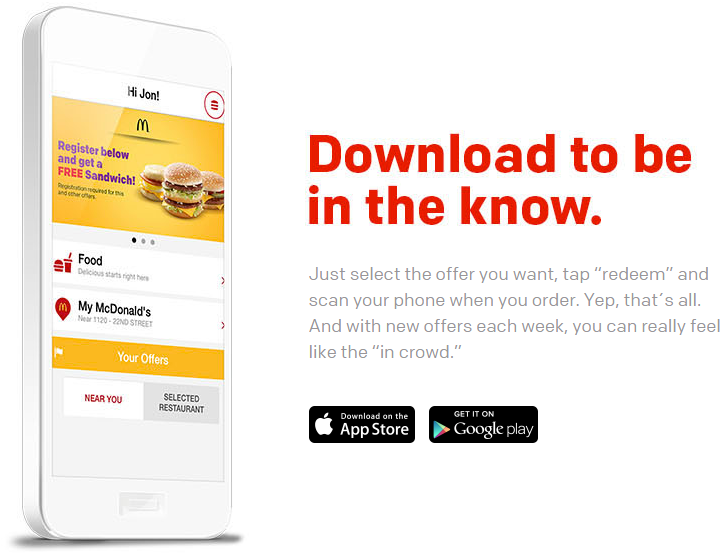 Installing the app also allows McDonald’s to use your email address to send information about the app and other special offers/discounts made available. Upon downloading it, you will be asked if you’d like to receive push notifications from the app. You may, at any time, cancel the push notifications. Keep in mind that altering push notifications will not adjust email settings. With those, you are either subscribed or unsubscribed. The McDonald’s App really has no surprises. It’s beautiful, intuitive, and if you enjoy going to McDonald’s – it’s handy. Just don’t use the app as an excuse to eat fast food every other day. 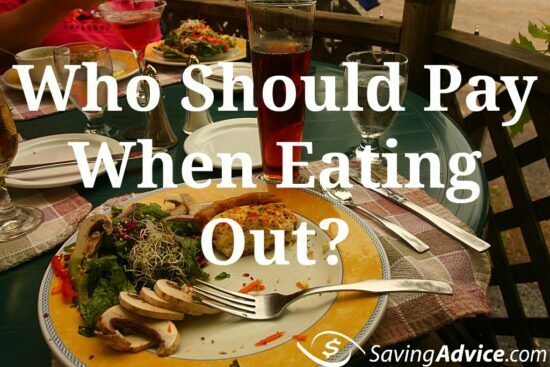 Cooking at home is the best way to save money and be healthy. A friend of mine was lamenting her inability to gracefully bow out of events and outings that she can’t really afford. “When my friends invite me out to dinner at a pricey restaurant or out to the movies, I hate to say no, but things are so tight around here that I can’t really afford to go,” she said. I told her that it was better to decline and save the money than to go and end up beating herself up over the waste. That was the crux of the problem. Not being able to go was one thing, but having to tell her friends that money was tight was the bigger problem. Being honest was what was tripping my friend up. I can understand. It’s not fun to be the one who can’t go out and it’s even less fun to admit that you can’t go because you can’t afford it. That opens you up to, perhaps, unwanted sympathy or pity form your friends, and it makes you a topic of conversation when you’re not there. “Oh, Sally couldn’t come because they’re having money problems,” begins the gossipy conversation. Of course, some “well meaning” friend will tell you about this conversation later, making you feel even worse. 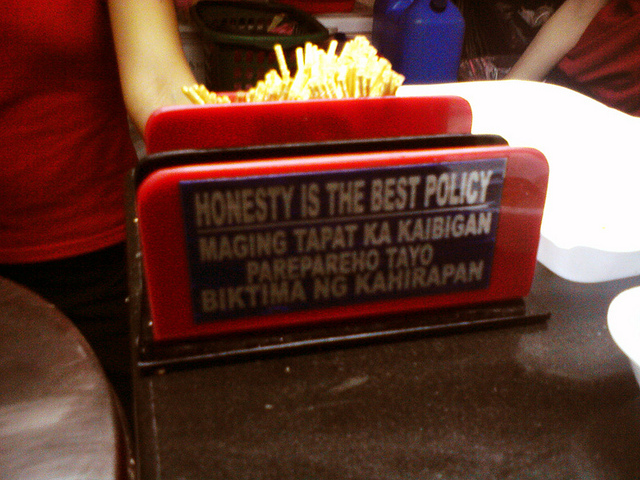 The thing is, honesty is often the best policy in these situations. If you say, “Oh, I can’t go tonight because I have other plans,” your friends will likely invite you to the next pricey event, too. If you decline that invitation because you again have “plans,” it’s not going to be long before your friends realize something is up. They may end up thinking you’re just blowing them off because you don’t want to spend time with them anymore. Ultimately you may find that your friends just give up on you altogether. If you’re honest and say, “That’s a little out of my price range right now,” and then suggest a reasonable alternative such as a cheaper restaurant, a matinée instead of an evening movie, or even a potluck dinner at your house, your friends will be more likely to understand and try to accommodate you. They won’t think you just don’t want to be with them. Honesty gives the relationship a chance to continue instead of dissolving in hurt feelings and the thought that you just didn’t care anymore. Being honest doesn’t mean you have to divulge every detail of your finances. You don’t have to tell them your debt level or exactly how much trouble you are in. If you don’t want to give details, you don’t have to. But letting it be known that you can’t afford something gives your friends a chance to include you in less expensive activities. They might even be relieved that someone else said it, first. You might be surprised to learn that some of them have their own problems and would like to scale back on the spendy activities. Who knows? You might be able to lead the way in coming up with frugal entertainment ideas. Of course, some people won’t care that you can’t afford something and they’ll take pleasure in ridiculing you for it, likely behind your back. They won’t try to scale back or make an effort to include you. They may shut you out of the group altogether. In that case, you have to ask yourself whether these people were really friends to begin with. Most people, though, will understand because maybe they’ve been there, too, or because they’re just good friends. Be honest about your situation and give them a chance to work with you. You’ll probably be surprised by their willingness to help.